and some are not. All of us seem to have at least a few difficult friends in our lives. They can range from those who are a mild annoyance to those who can make life seem nearly intolerable at times. People at this negative end of the continuum, especially if we have contact with them on a daily basis, can jeopardize our mental and emotional wellness over time – particularly if we lack the tools for responding to them in an adaptive way. There is no single, easily described category of difficult people. A person who presents difficulty for one person may not be at all difficult for someone else. We all know friends who get along well with our “enemies” and we may not understand how this can be. Indeed, we may feel betrayed by our friends who have good relations with those we can’t tolerate. Our perception of who is difficult may reflect more about ourselves – our own needs and tolerances – than about the other person. Dealing with those we find difficult can present a personal challenge which invites us to look within and to develop more positive coping responses. their shoes, so to speak. And, using these cues as our guide, we try to respond to them in a way that leads to a productive, harmonious, conflict-free social exchange. D epending on the cues we perceive from the other person, we act just a little different around each person with whom we have contact – and this is adaptive. Sometimes, however, the role-taking process breaks down – and this may be due to a number of reasons. ●	In the first place, the other person may give conflicting cues so that it is difficult to know just how to respond appropriately. For example, one would hardly know how to respond to a person who seems friendly and approachable, but who then proceeds to insult you. ●	Or, we may not be able to read cues accurately from the other person. Does this person remind you of a childhood friend who caused you unbearable anguish years ago? If so, our responses toward this person may be colored by our own hurt feelings, and this may sabotage an adaptive interaction. ●	Similarly, sometimes there is simply an inexplicable conflict between personalities. Just as we use the notion of “chemistry” to explain why two people are attracted to each other, we can use the same idea to explain why some people are unable to tolerate each other. The “chemistry” is just not right. Who Are the Difficult People? ♦	People who dominate conversations and never give anyone else a chance to talk – or people who seem to have no interest at all in what you have to say. Whenever you offer something about yourself to the conversation, they ignore you, interrupt you, and immediately turn it back to themselves. ♦	People who constantly berate themselves – and other people. Everything they say about themselves, and others, carries a negative message. ♦	Skeptics who don’t seem to believe a word you say. They question everything in a cynical way. ♦	Addicts who seem intent on destroying themselves. They may abuse alcohol, drugs, food – or their relationships. Substance abusers tend to swing arbitrarily between liking you and disliking you. They often lack the consistency that is necessary to sustain a relationship. ♦	People who can’t make a decision – and when there is any sort of conflict, they hide out until they feel it’s safe to re-emerge. This behavior makes it difficult to work out the normal conflicts inherent in many relationships. ♦	Gossips who seem more interested in everybody else’s business rather than their own. Some gossips seem to take pleasure in fomenting trouble for other people. It is difficult to reveal anything about yourself if you feel that it may be taken out of context and spread to others. This leads to guarded and superficial relationships. ♦	People who manipulate you into doing what they want. They seem to thrive on control, and you sense that your opinions or feelings don’t count. ♦	People who lack consistency in their lives. We don’t know if their mood from day to day is going to be positive or negative – so it takes a lot of work to read their cues and to keep things on an even keel. ♦	Dependent people who seem unable to do things for themselves. They constantly ask for your help (when the best help may be to allow them to contend with their own life challenges). ♦	Angry people who seem ready to explode at any moment. Their “jokes” may carry an aggressive message and their passive-aggression may lead to a lack of trust. ♦	People who feel terribly uncomfortable around others. When they talk, you have the feeling that their words have been rehearsed so that spontaneous interaction becomes impossible. ♦	People who lie all the time. You can see the inconsistencies in their lies and everything on their part seems like a massive and desperate coverup. ♦	Flatterers who lavish you with praise, but you never have the feeling that they truly care about you in a meaningful way. ♦	The expert on everything. Rather than talking, they lecture – and they leave others with the feeling that their knowledge is insignificant. They seem to be in a constant state of competition. 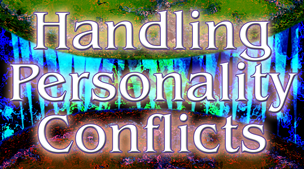 Learning to handle ourselves effectively with difficult people is one of life’s expected challenges. Few of us are immune from interactions with people who have the capacity to make our lives miserable. It is not our place to try to change other people (it is difficult enough to make changes in our own lives!). If and when other people decide to come to terms with their problems, they will. The basic clue is to look within ourselves and to understand that it is we who experience the difficulty. As responsible people, we may feel the need to understand the source of this felt difficulty and take productive action to protect ourselves from its negative consequences. There are a number of techniques that can be used to reduce the unfavorable feelings these difficult people may have on us. In the presence of a troublesome person, we may feel uneasy or, if the circumstances are bad enough, even desperate. Although we may normally be healthy and gentle, interacting with a person who creates discomfort can bring out behaviors in us that we hardly recognize and may bring us shame. It is important to never use violence to deal with frustrations generated by another. Furthermore, we should not internalize our anger to the degree that we engage in self-destructive behavior. Believing that the other person “drove me to drink” is never acceptable and simply serves to empower their negative behavior. When you are in the presence of a person who is driving you to desperation, try some “self-talk.” Think about your own strengths and your own capacities to like and validate yourself. Stay focused within. Understand that it is the other person who has the problem – but remember that it is your responsibility to understand why you are unable to deal with this person. Take some deep and relaxing breaths, and focus on tolerating the discomfort. If you harbor obsessive negative thoughts, tell yourself, “Stop!” You can feel powerful within yourself by maintaining your integrity. Depending on the nature of the other person’s behavior, there may be a time to take the assertive stance. Assertiveness is not an expression of anger, but rather an affirmation of your rights. Assertive responses usually carry a logical, rational tone that is not clouded with emotion – and they can be much more effective than angrily lashing out at the other person. In response to the dependent person’s constant pleas for help, rather than being driven to frustration, you might say, “I would feel more comfortable having some equality in our friendship, so I am going to ask you to call the restaurant yourself, just as I did the last several times we went out for dinner.” When a person insults you, simply say, “I don’t deserve an insult, and I am going to ask you not to say this type of thing to me again.” People often appreciate this honest and constructive feedback – and they may appreciate you for having the courage to bring the issue up in a direct way. Most people with behavioral difficulties have good intentions, and they may not know that their behavior causes you discomfort – or, if they are aware of this, how to resolve the problem. They keep responding to others with the same behavior and run into the same difficulties with people repeatedly. You might try “decoding” their behavior. In other words, try to understand their underlying needs. And rather than reacting to their surface words and actions, respond to these basic needs instead. For example, if a person is controlling or manipulative, understand that they probably feel very insecure within – so assure them in order to alleviate their insecurity (“Everything is all right – you can count on me”). If a person lies all the time, it is probably because of negative self-esteem and trust issues (tell them: “You have such good qualities that I genuinely like, and I want you to know that I will be here for you consistently and honestly”). Your responses will probably not solve their deeper issues, but at least they may set a positive tone for your future interactions. If nothing else works, there may come a time for a relationship to end. This can be a difficult option if the other person is a family member or significant friend. It takes courage to end the poisonous nature of some of our relationships, and dealing with the loss will be part of the process. Sometimes this is what we need to do in order to preserve our own sense of integrity. a life in which everything always goes your way. There are no problems, no money worries, no health concerns – and no difficult people. There is no job insecurity, no traffic jams, and everybody treats you as if you were wonderful. You can eat what you want and buy anything you desire. Make a wish and it will come true. Many of us – and this is unfortunate – long for this state of being. Some people make enough money to retire early just so they can have a life that resembles this dream-like situation. Others resort to drugs or alcohol to create the illusion that they live a hasslefree life. But there is a problem when we achieve this state – which, in truth, none of us ever do. We never grow. We are never fully alive. We are never challenged. Difficulties are an essential part of life. They give us opportunities to learn, to adapt, and to achieve wisdom. In a sense, we should be grateful that there are difficult people in our lives. Dealing with difficult people forces us to feel discomfort, to look within, and then to learn to alleviate it by acquiring a more diverse and adaptive set of responses. Try this exercise. Write down a list of the difficult people in your life. Just their names will do. And beside each name, jot down four or five adjectives which describe why the person is difficult for you. One item in your list of people might look like this – “John: self-centered, controlling, manipulative, untrustworthy.” When the list is finished, go through all of the adjectives and see if there are any that repeat themselves. For example, you might see the word “controlling” frequently in your list. And now you have learned something about yourself – you need to learn how to handle controlling people! And what a splendid challenge this is. Working on this with a professional therapist can yield a world of new insights and clues for solving problems more flexibly. Copyright © 2010 Simmonds Pub.